"It started on the last day of high school... a day Diana Hansen had been anticipating for the last twelve years. Now her real life could begin... For Diana, like her sister Claire, was a Keeper - gifted with the ability to reweave the possibilities of time and space to maintain the balance between Light and Darkness. What neither Diana nor Sam - formerly an angel, now a cat - could have anticipated was that her first Summons as an active Keeper would be to a shopping mall! But a quick trip to the Erlking's Emporium, a gift shop in a Kingston mall, confirmed Diana's worst suspicions. Not only was Darkness trying to stage a takeover from the Otherside, but if Diana didn't bring reinforcements, her first Summons might well be her last. Claire and Austin - who'd always been a cat and had little tolerance for cat wanna-bes like Sam - were only too ready to take on the "older and wiser" roles. But neither the Keepers nor their cats were prepared for what thet found when they tried to cross from their world to the Otherside mall..."
TBR pile. Goes to BlossomU next. 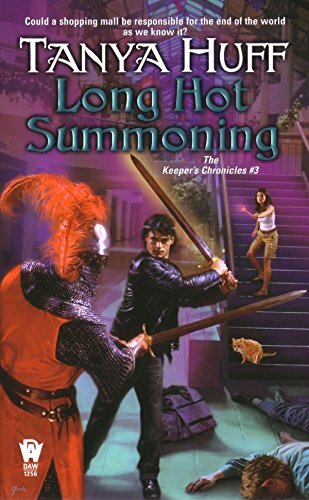 Keepers, talking cats, magic, humour, mall elves, and Hell again. This was an enjoyable book to read over the weekend, but not quite as good as the previous ones. The story is centered on Diane, Sam and Claire (and the mall elves). I would've liked to read a bit more about Dean and Austin. What a lovely surprise, thanks, myntti! I might take a while to get it read, but will save it for when I am really in need of something light and funny. I just finished reading it and totally agree, not as good as the first ones. Before reading this I was hoping for a fourth or even more books, after reading it, bah.... Whatever was light and hilarious in the previous books here can became tedious and/or inane. Diana and Claire try to stop a mall being used ( by the forces of Hell, presumably) to take over the world. I did not care - the cats were annoying, the anime Arthur thing too much ( though admittedly he does look cute on the cover), plot was confusing and contrived, and the "what you expect" aspect of the universe can feel like a writer´s trick. Though I did want to read this very much, big thanks myntti! Book is reserved for erthgoddss, will try to have it shipped within a couple days.